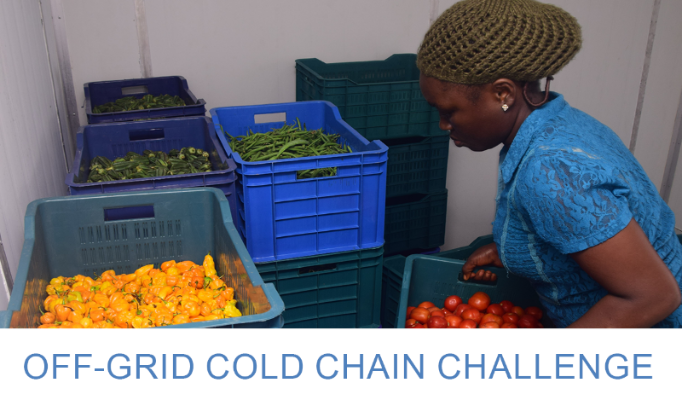 The Global LEAP Off-Grid Cold Chain Challenge (OGCCC) and the UK Department for International Development (DFID) are excited to announce the 10 finalists of our international competition to identify the most energy-efficient, sustainable, and cost-effective cold storage technologies for fresh fruits, vegetables, and dairy products. Fourteen expert judges evaluated 28 entries from 12 countries on 5 continents. Finalist selections are based on financial viability, potential end-user impact, understanding of the product’s target market, and overall sustainability. Technology innovation companies ColdHubs, DGrid Energy,Ecolife, EcoZen Solutions, FreshBox, InspiraFarms, Inviro Choice Solutions,SunDanzer, The Off Grid Factory, and Tiger Power will receive 10,000 GBP each to deploy their cold storage systems in one of 11 target countries over the course of the next two months. Profiles of the finalists and their innovative approaches will be shared on the Global LEAP website over the next few months, with overall winners announced in May 2019. The OGCCC is a part of the Ideas to Impact program, which is funded by UK Aid, delivered by DFID, and implemented by an IMC Worldwide-led consortium. Ideas to Impact designs and runs prizes to stimulate innovative solutions to climate change adaptation and access to energy, water, sanitation, and hygiene. OGCCC is also supported by Power Africa’s Beyond the Grid initiative. OGCCC is implemented in partnership with Energy 4 Impact, a non-profit organization working with local businesses to extend access to energy in Africa, to improve livelihoods and accelerate economic growth.